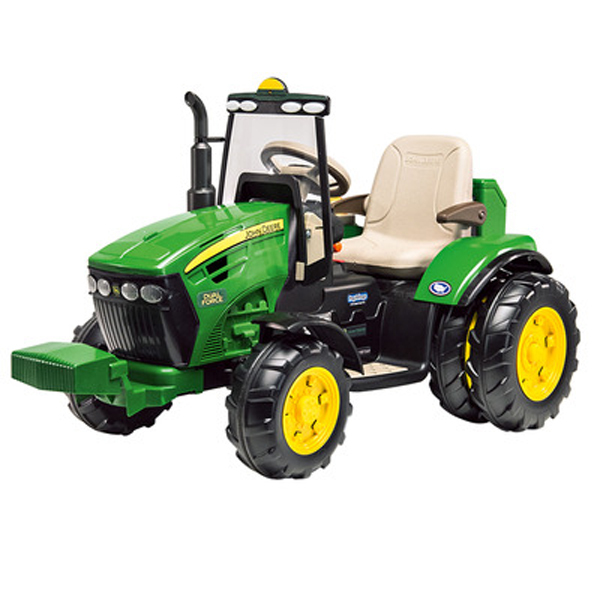 Upgrade your fun with the John Deere Dual Force by Peg Perego! The John Deere Dual Force includes a removable tool case that is equipped with a tool kit so riders will always be prepared to make a repair. It can travel at two speeds – 2.25 mph and 4.5 mph, plus reverse. Parents will love being able to control the vehicle speed of beginning riders with the 2nd gear lockout feature. An adjustable seat with flip-up armrests lets the Dual Force grow with child and a decorative windshield, smokestack and counterweight help to give it a next level look that kids will enjoy. Weight Capacity – Can hold up to 88-lbs. Working FM radio with electronic tuning. Shipping charges reflect UPS dimensional shipping surcharge due to the weight and shipping dimensions of this great product! Q: Does this have a motor for each back wheel? A: This tractor only has 1 motor for both wheels. Q: Can you hook a trailer to this tractor? A: It is not listed that this unit is compatible with a trailer. A: A battery and charger is included with this product. Sales tax is only applied if the product is shipping within Illinois or Indiana. Q: What is the maximum child height for this model? A: As long as the child does not exceed the 88lbs weight capacity, there is no listed maximum height.